I love the faff and the messiness of eating this delicacy and I think it's all worth it for the amazing taste - my wife doesn't! Only my younger daughter liked them as well so I doubt they're going to become a regular feature in this house! 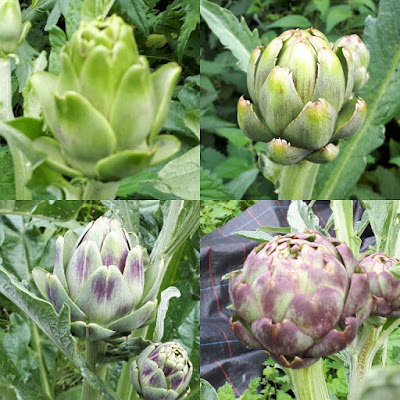 Looking at the four heads in the picture above, they all came from the same packet of seed, a purple variety, so I think it's fair to say the seed company had some cross pollination! Might have to let them know if I can find the packet! We simply boil ours for around half an hour and serve with a little butter. The hearts in the middle taste divine! They are pretty much they only thing you can eat where you seem to end up with more than you started with. These were heads off plants I sowed this year as well, I was reading somewhere today how they don't harvest them the first year, but I've never had any problems with them. So where do you stand on this giant thistle with edible flower buds? Love it or don't think it's worth the effort? I pick them fairly small, boil them, chop out the choke and dress with lemon juice, rapeseed oil and chopped thyme. They don't feed an army but we with have courgettes, beetroot and beans for that job. All the outer leaves make a good anti-slug mulch which is quite timely as after the recent rain the slugs are out in force and I have a lot of late sowings to protect. How do you use them for anti slug mulch? The cooked leaves? Or are they raw? I use the cooked leaves at my allotment. I think it was Sarah Raven who said the cooked leaves make a good mulch in the veg garden. Next time I'll keep them back and put them round some lettuce. My children and I like them but my husband isn't keen. I like preserving the little ones in oil as antipasti so I'm planning on growing my own next year. Sounds good! I'll let a few go to seed so you can have some if you like? Hi, I've only just seen this, yes please! Haha, pass! But great you enjoy them! Love them! Just a shame my wife doesnt. Like broad beans, I could.live on them my wife wouldn't! I used to grow them in my mixed border as they have great ornamental value! They are beautiful and have good structural value. No mixed boarders here though. These are growing through plastic! I never seem to be able to harvest them at the right time and have to leave them to flower for the bees. Still beautiful though. I just get them before they open. Small is quiet tasty as well. Love them for flower arranging, to eat? no thanks. Good idea hadn't thought of that. I used to have about a dozen plants; I now have just one. I like them, my wife doesn't. I love them. My dear Dad can't stand any type of artichoke, be it these, Jerusalem artichokes or chokoes - think he was fed them as a child. You can have "artichoke sessions" with your younger daughter, a special time together. Sending care and kind wishes from Wellington, NZ. Yeah, it would be nice to have meal with her eating them. The other two children liked pulling them apart just wouldn't eat them! We like them too - the messiness is part of the fun. They are also good picked small (about 3cm diameter), blanched whole in boiling water for literally moments, then fried gently for a few minutes in olive oil & garlic (sometimes also with onion & tomatoes) until a knife will go easily through the thickest part. Cooked this way, every part can be eaten including some of the stem if they are picked young enough. I've also read of them being roasted in oil & garlic instead of frying. 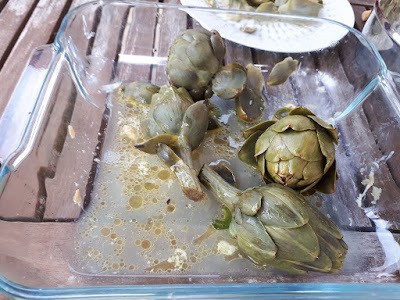 If the artichokes get huge, I speedily chop off all the outer leaves, scoop out the choke & get them into lemon or vinegar water to keep the colour. 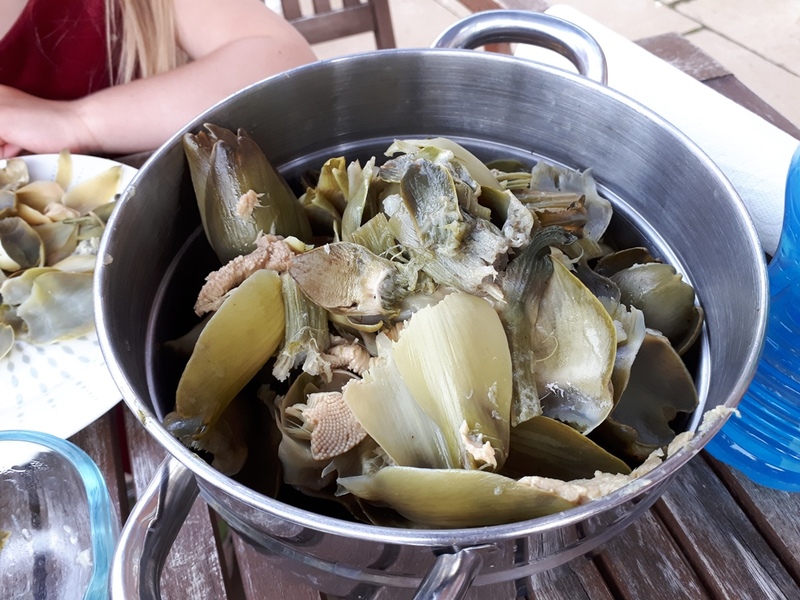 Then boil them as ready prepared artichoke hearts, which are good for fussy eaters, & can be dressed with sauces or stuffed with breadcrumbs etc. I'm going to try both of these methods. I like the sound of the whole small ones, I bet they're delicious fried with garlic (most stuff is! ).